Grasses found along the banks. Ducks feed off of larvae and pupae usually found under rocks, aquatic animals, plant material, seeds, small fish, snails, and crabs. Geese consume a wide variety of plant material, including grass, leaves, roots, etc. They may also feed on aquatic plant material and waste grain left in plowed fields, as well as mollusks, crustaceans and even small fish. Many of them (such as the Roman Rufted Geese) also eat bugs, which makes them an excellent choice for those wishing to control insect populations in the backyard. 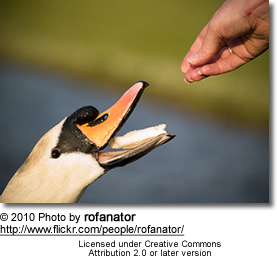 Note: Feeding geese is likely to reduce or even eliminates their value as natural insect controller in the backyard. Please refer to the natural diet as described above or on the relevant species pages ... If possible, feed items that are close to their natural diet. Particularly in the winter months when grasses or other plant vegetation is scarce, greens such as dark green lettuce, spinach, chopped/shredded carrots, celery and alfalfa sprouts and other vegetables and greens make a great supplement. Note that lettuce may be an acquired taste and the swans may take a while to get used to it. Any vegetables need to be cut up into small pieces. Remember, birds don't have teeth! Any food should be thrown onto the water so that they can swallow water together with the food, which helps them digest the food more easily. Also, feeding swans, ducks and geese on land encourages them to leave the water whenever they see people, which can put them at significant risk if dogs or other predators are about. Also remember, even though you obviously have a deep love for these magnificent birds, there are people out there who will harm them. 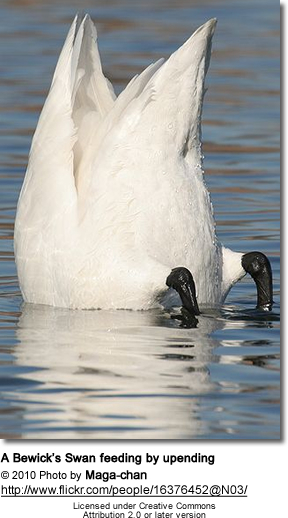 Turning swans into trusting pets will put them at risk of being targeted by these sick individuals. Watch and enjoy them from afar, not drawing their attention to you as much as possible.